Hey, Seattle gang! What are you up to this Saturday? Are you going to Pedaler’s Fair? Pedaler’s Fair is a marketplace of Washington based, bicycle-inspired small businesses – but it’s way more than that! There will also be live music, workshops, presentations, and a Bicitoro Craft Table for your crafty pleasure. Check out the schedule of events for everything that will be happening, including Bicycle Yoga, a camp cooking presentation, and a film screening. I’ll be there from 11-5, hosting a table where you can come get your bike craft on. Come say hello! If you’re planning on biking there, consider joining up with the Critical Lass Ride, which will be starting at Fuel Coffee in Montlake at 9:30. I’ll be riding along. 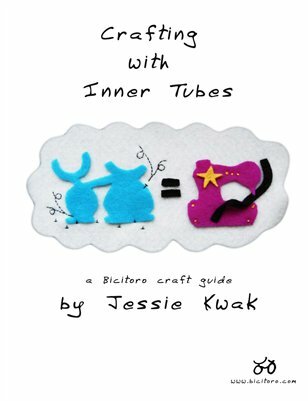 Okay, all the teasing is over — I’m now officially ready to launch the first-ever Bicitoro ebook: Crafting with Inner Tubes. Click to read more about it. You can even snag a copy of your own if you want – I won’t stop you. I already gushed about it a ton last week and on its sales page, so I’ll spare you much more here. I’m selling it for $6, but I’ve got a special deal for anyone who’s subscribed to my email list — it’s only $0.99 until April 15. Sign up for the list and I’ll send you the code.